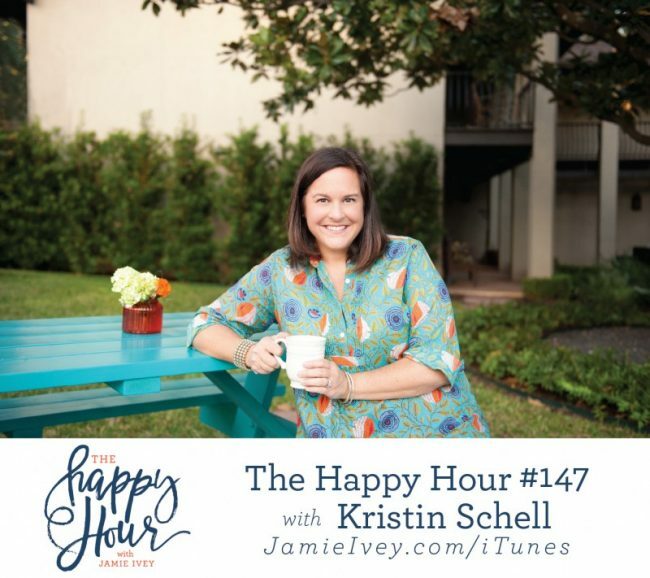 My guest for The Happy Hour #147 is Kristin Schell. Kristin is an established speaker and blogger on the subjects of food, faith, and hospitality. As founder of the Turquoise Table and Front Yard People movement, Kristin travels the country speaking at conferences and events with an encouraging word on how to open our lives and homes to others. She lives in Austin, Texas, with her husband, Tony, and their four children. Kristin and the Turquoise Table has been featured in a wide variety of media outlets including the The Today Show, Austin American-Statesman, KEYE-TV/CBS Austin, MOPS International. Today's show is a little different with a live recording of our summer book club. Kristin and 50 other ladies joined me in my back yard for a conversation about The Turquoise Table. We chat about opening our lives up to the people around us and loving where we live. We talk about practicing hospitality in every life stage and no matter what your space looks like. I absolutely loved Kristin's book and loved being able to chat with her in person about how she champions the front yard people movement in her life. If you haven't already read her book, make sure to grab one here. You won't regret it. You know I'm a Noonday fan, so this summer we're teaming up to do a little 'join with jamie' promotion! Go to jamieivey.noondaycollection.com and you will see all the fun, FREE Noonday products added to your starter kit this summer just because you're a listener! If you've heard of Noonday and are wanting to become an Ambassador, now's the time! Are you hiring? Do you know where to post your job to find the best candidates? Finding great talent can be tough. Thankfully, with ZipRecruiter, you can post your job to 100 plus job sites with just one click. Then, their powerful technology efficiently matches the RIGHT people to your job—better than anyone else. That’s why ZipRecruiter is different. Unlike other job sites, ZipRecruiter doesn’t depend on candidates finding you; it finds them. In fact, over 80% of jobs posted on ZipRecruiter get a qualified candidate in just 24 hours! Find out today why ZipRecruiter has been used by businesses of all sizes to find the most qualified job candidates with immediate results. And right now, you can post jobs on ZipRecruiter for FREE. Just go to ZipRecruiter.com/HH.